Let’s be honest. Designing a backyard retreat can be intimidating. One way to make the process manageable and fun is to consider adding a hot tub to your deck or patio. We’ve created a design idea guide with 13 distinctive home styles that each feature an elegant, high-performance Utopia® Series spa. 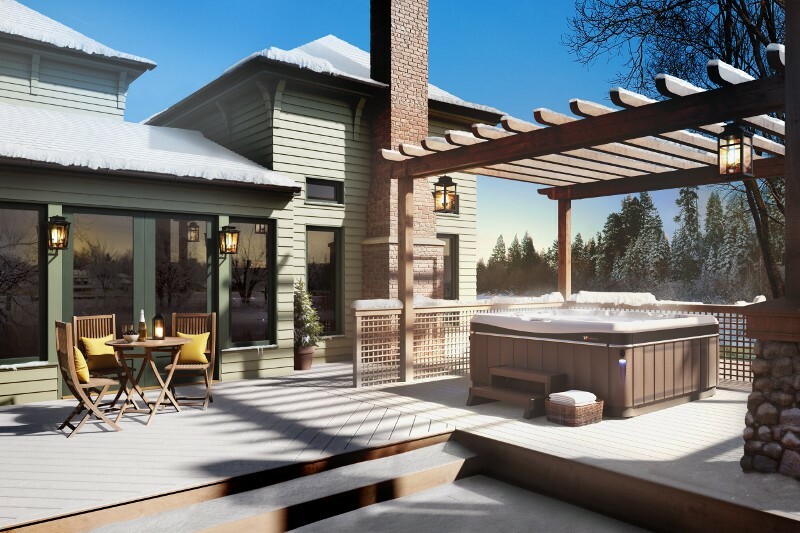 Utopia® Series hot tubs make an ideal focal point for creating the backyard spa design of your dreams. These elegant hot tubs integrate with a wide range of architectural styles, from Cottage to Contemporary, Tuscan to Townhouse, and Mediterranean to Mid-Century Modern. 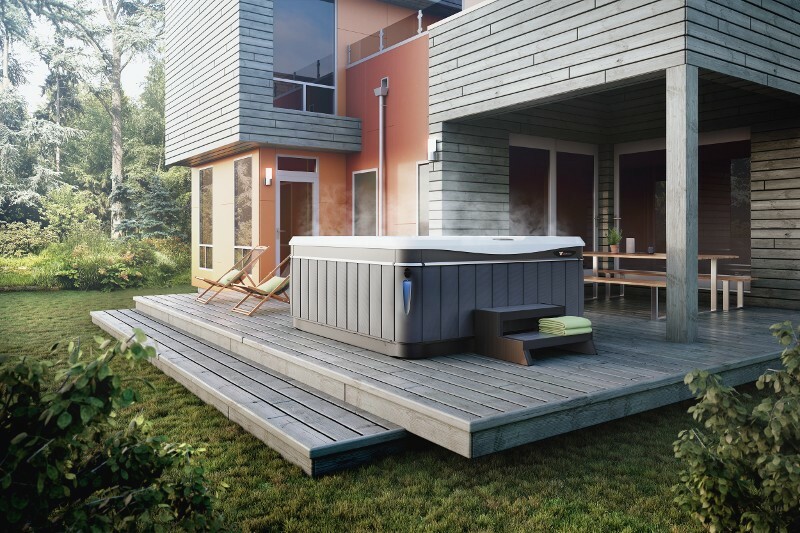 This versatility makes it easy for you to get the wellness benefits of adding a hot tub to your backyard space without sacrificing your design style. If the typical simulated wood siding found on most hot tubs leaves you feeling uninspired, scroll through the backyard photos below. 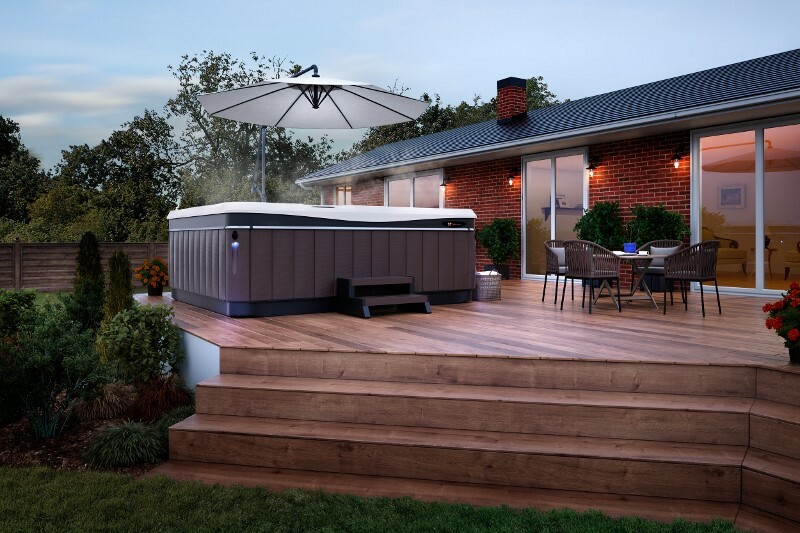 Each backyard design includes a hot tub featuring the unique Avante™ cabinet on our Utopia spas that is unlike any other hot tub cabinet you’ll see. With clean lines and appealing aesthetics, it may be just the right fit to make your backyard makeover a show-stopper. Every backyard design project starts with a plan. Learn the design elements of your preferred style and apply accordingly. Aim to integrate similar elements. Stay true to your style. If you want simple leave it simple. If you want something more elaborate include hardscapes, coverings, plants, greenery, and patio furnishings with plenty of popping accents of color. When in doubt contact a design professional for assistance. 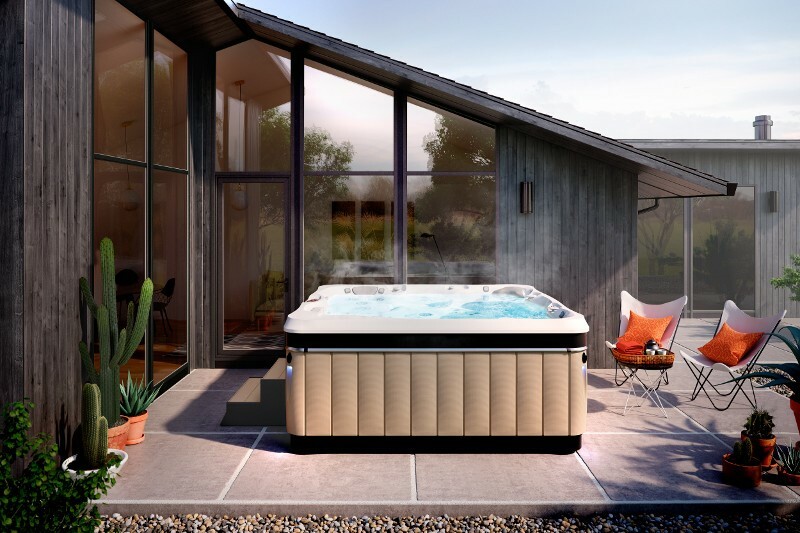 If you are the lucky owner of a Craftsman, Bungalow, Arts and Crafts, or Mission home style then you will appreciate the symmetrical proportions of the Utopia Series spas. The clean lines of the cabinetry shown above in Brownstone fit with the mix of materials including the two-toned wood deck, pergola, metal gate accents, and stone plasters. The teak chairs and cocktail table complete the look. These homes portray a composite of cultural influences that create a relaxed, easy-living experience. Water features add a cooling effect to backyards, courtyards and patios. The rich color of the Avante all-climate cabinet seen here in Brownstone compliments the tones of the terracotta tile and neutral adobe hues of the home. The sculptured cabinet siding provides symmetry while aligning with the arched windows and doorways for a cohesive look. The Ranch style of architecture leans toward simplicity when it comes to ornamentation, and so do the Utopia Series Spas. The profile of the spa and sculptured cabinet siding find harmony with the shape and lines of the Ranch aesthetic. The color versatility of the Avante all-climate cabinetry available in Sand, Slate and shown here in Brownstone complements all natural wood tones. The use of wood decking adds dimension by integrating raised levels that maintain the long and low feel of a Ranch Style home. The view from inside any large sliding glass window tells you the Utopia Series Spa has the stand-alone beauty to be the focal point of your backyard design project. Neutral cabinet colors such as Slate shown here on the Avante all-climate cabinet blend with the surrounding gray tones of the hardscape and furniture. Brownstone and Sand are also color options if your natural stone expresses more gold, red or blue undertones. All provide a cohesive, eye-pleasing connection to the farmhouse cottage style. Whether your farmhouse cottage lays claim in the south, north, east or west, The Avante all-climate cabinetry shown here withstands harsh winters and the blazing summer sun. The special composite material will not chip, split or crack. Today’s contemporary homes speak to a desire for ample entertaining space, especially outdoors. Streamlined architectural elements promote a clean and simple vibe beaming with modern-day sophistication. The clean, symmetrical lines of a Utopia Series Spa allow it to fit seamlessly within a contemporary design plan. Your spa possesses the stand-alone beauty to be a backyard focal point. The sculptural cabinet siding seen here in Slate marries well with the home’s reclaimed wood accented with vibrant color. Exterior lighting on the Utopia Series Spa also adds its own punch of color. Sling-back chairs and a simple, defined dining table add functionality to your space without distracting from your minimalist motif. The concept of bringing the outside in is the essence of Midcentury modern architecture. Floor-to-ceiling windows ensure this. The importance of the outdoor elements is just as vital as the interior elements of any midcentury modern home. The common use of squares and geometric shapes in midcentury modern design make the profile of the Caldera hydrotherapy spa conducive to being placed as a focal point, or a contributor to the larger design plan. While standing inside the home your eye is drawn outside to the beauty of the spa and how easily it works with the bring-the-inside-out principle of the midcentury modern aesthetic. 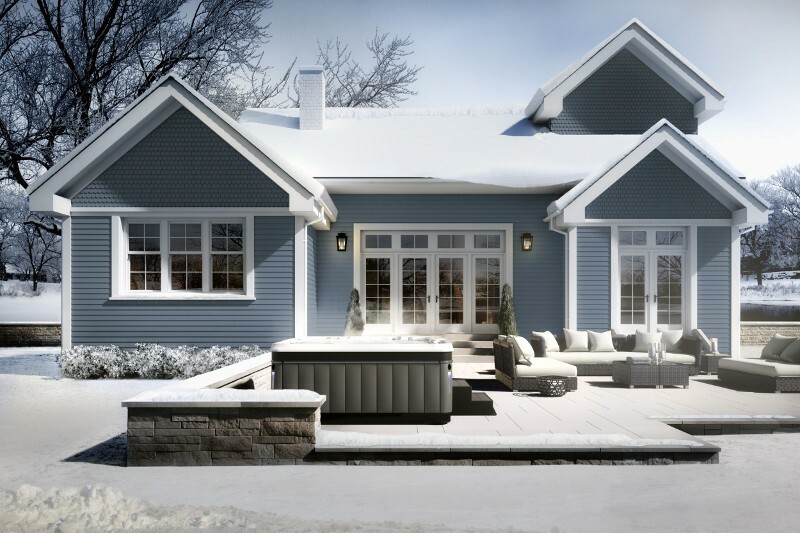 For a comprehensive overview of these home styles and more, check out our 13 Inspiring Backyard Hot Tub Design Ideas Guide and let us know what design inspires you the most. Contact a dealer near you to discover how easy and affordable it is to enjoy your own Caldera® Spa and experience improved health and well-being by enjoying your hot tub often.